Increased Property Value: More and more tenants both commercial and residential are looking for “outdoor” space. Some of the cities most desirable neighborhoods are near green park space. Converting roof space into green park space is perhaps one of the most important marketing and sales options available – especially for tenants with children and the future generation who are beginning to demand this of their living environment. In a more direct way, a property that has undertaken a green roof installation properly with a roofing system and structure evaluation has added value – similar to a property that has just completed major façade work or a other capital investments. Insulation Properties: Green Roofs have a limited yet present thermal insulation property. This is probably more significant in the summer time where the shading affect reduces surface temperature thus lowering cooling load requirements. However, deeper mounded or intensive type green roofs provide thermal mass that also can aid in wintertime with insulation similar in principle to the Great Plains sod-homes of early pioneers. 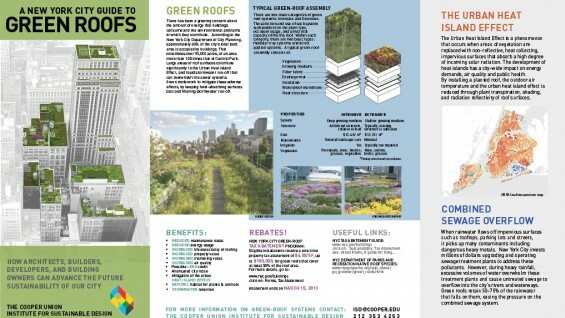 Noise Reduction: Green Roofs assist in dampening noise. The multifaceted surfaces of plants and porous nature of the material help to both deflect and absorb noise not only of the city but can also assist in dampening rooftop mechanical equipment. Tenant Amenity: A Green Roof is an amenity and therefore has a greater appeal. In the same vein as the increased property value for the Owner and the Marketing aspect for Property Management Building Portfolios, a Green Roof can become a feature the individual tenants take pride and value in which in turn creates a unique place of residence whether primary or a place of work. This can also assist towards offsetting maintenance and installation depending on how amenities are developed at individual properties. There are cases in which parts of a Green Roof environment are established as limited tenant agriculture areas and then leased to individuals. Not only can this be a source of income as noted above, it can also provide learning and pleasure. Storm Water Retention: In the greater picture, Green Roof installations assist in retaining storm water run-off that is a major course of pollution to our waterways. When rainwater flows off impervious surfaces such as rooftops, parking lots and streets, it picks up contaminants including dangerous heavy metals. In New York City (as well as many other communities) during heavy rainfall, excessive volumes cause untreated sewage to overflow into the city’s waterways and can overwhelm the sewer treatment plants. There have been some efforts by local authorities to curb the degree of water run-off including anywhere from timed draining with special rooftop drain bowls to even the possibility of surcharging for run off. Many tray styled systems for Green Roofs have cupped dimples that hold water, which eventually is used by the plant material. Green roofs retain 50–75% of the rainwater that falls on them, easing the pressure on the combined sewage overflow system. 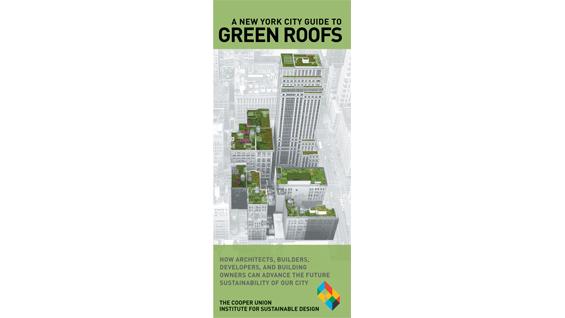 Heat Island Effect: Also in the greater picture, Green Roof installations lower the degree a roof heats up in the day and then releases thru the night creating a virtual bubble or island affect in large urban areas with higher temperatures. Reflective roofs also assist in reducing heat island effect – however the Green Roof has the added benefit of absorption and transpiration – not simply reflection. Additionally plants assist in cooling through evapotranspiration which overall will not simply reflect the heat but actually assist towards cooling. 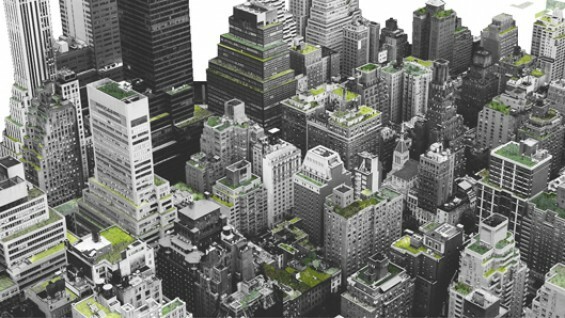 NYC Tax Abatement: Building owners in New York City who install Green Roofs on at least 50 percent of available rooftop space can apply for a one-year property tax credit of up to $100,000. Click here for more information.